Here are the comments SNC submitted to the City on the current proposal. We will keep you updated on their response and any upcoming additional comment periods. They City is taking comments on the Garden District PUD, including the Crestline Connection until Tuesday, July 31st. You can see the proposed site plan (without the connector), review the SEPA report, and in a separate document see the traffic impacts in the Trip Generation Letter (though the report shows the impacts with the connector, not the revised plan without it). 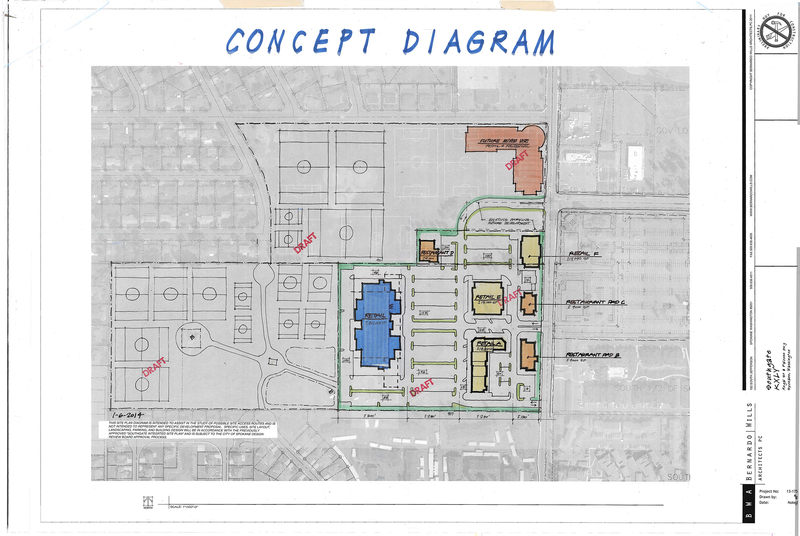 This is the revised site plan showing no connection of Crestline to Southeast Blvd. This is the Agency and Department Comment Period. There will be additional chances to comment during the public comment period, during the Hearing Examiner review of the PUD application, and at the Plan Commission and City Council when they consider the recently added Comp Plan Amendment to remove the Crestline connector from the City’s Arterial Street Map. You can send your comments this round to Tami Palmquist at the City’s Planning Department: tpalmquist@spokanecity.org. They need to be in by 5pm on Tuesday, July 31st. KXLY is proposing to purchase 2 acres of city-owned land along Regal Street as part of their plans to develop their part of the Southgate District Center. This sale proposal and what it means for our neighborhood will be a major topic of our November meeting. Below you will find some background information as well as copies of the latest version of the proposed sale agreement (PSA) and drafts of KXLY’s larger proposal for a land swap involving the Southeast Sports Complex. Just to refresh everyone’s memory, KXLY owns 15 acres of land on the west side of Regal Street across from the new Target center and south of the Southeast Soccer Complex that is part of the Southgate District Center. They also own an additional 15 acres of land behind their property on Regal that has their broadcast tower located on it (this will be important in a minute). Their District Center parcel is subject to a Developer Agreement with the city passed in 2009 that allows them to build a big box store up to 108,000 square feet (for reference, Shopko is about 95,000 sqft) and the property is zoned Center and Corridor 2 (CC2), just like Target. An overview of the Southgate District Center with the KXLY properties highlighted. Directly to the north of KXLY’s property along Regal lies a small 2 acre parcel that was formerly owned by District 81. In 2013 this land was swapped for 20 acres of city-owned land by Joe Albi Stadium. Now the KXLY is proposing to purchase the 2 acre parcel from the city in order to gain easier access to their District Center property from the new stoplight at Regal Street and Palouse Hwy. The Southgate Neighborhood’s appeal settlement (in the form of an ISP Implementation Memo) for the right-of-way design in the District Center be finalized prior to the sale of the land to KXLY. Development of this property is subject to the notification provisions recent adopted by the city and that our District 2 city council members be notified as well. The property be zoned CC2 (currently it is zoned single-famiy residential) to match the rest of the Southgate District Center. The property would be subject to the existing KXLY Developer’s Agreement. KXLY agrees to substantive input/collaboration with the neighborhood on site plans, infrastructure, public realm, and architecture related to the ISP or Southgate Neighborhood Plan. KXLY will have obtained an easement from the City of Spokane Park Board for pedestrian, vehicle, and utility access to the intersection at Regals Street and Palouse Highway. Since late September the city, Southgate Neighborhood Council, and the developers have been ironing out the wording and details of the Purchase and Sale Agreement. We will discuss this in detail at the Southgate Neighborhood Council Meeting on Wednesday, November 11th. Please plan on coming to listen to the details and provide your thoughts on this proposal. 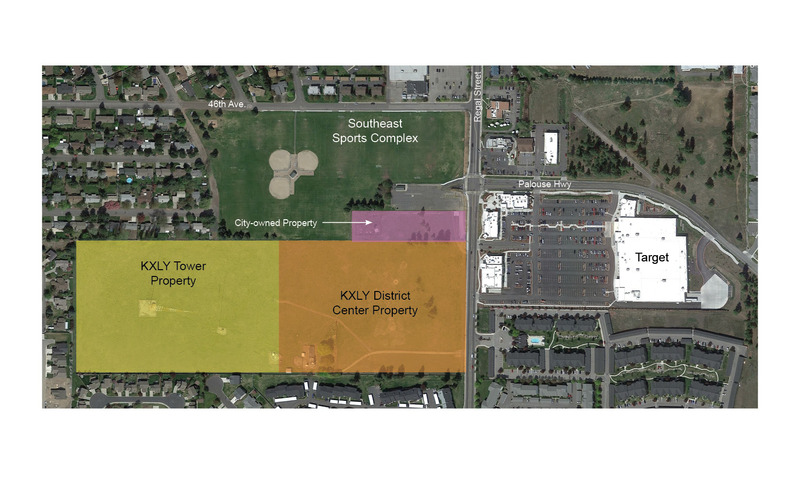 As mentioned above, KXLY has proposed an easement across the Southeast Sports Complex as condition of the sale of the city land (meaning if they can’t get the easement, they don’t have to buy the land). This easement is a critical component of KXLY’s plans for developing their property in the District Center. It provides them signalized access to their property and will provide easier access to the businesses in their development. It is also the first step in a larger proposal they made 21 months ago to the Spokane Park Board for a larger land swap along Regal Street. 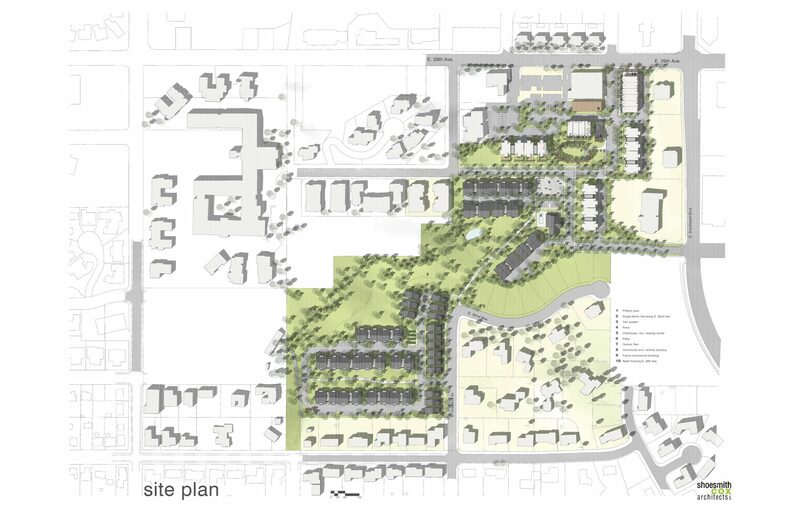 In January 2014, KXLY’s architect and lawyer presented a draft proposal for a land swap wherein KXLY would take control of the eastern part of the Southeast Sports Complex (along Regal Street and 46th Ave.) and swap the Parks Department for some of the land behind their District Center property (under the radio tower). See, I told you that other property would be important. Image of the draft land swap proposed by KXLY to the Park Board in January 2014 with proposed land purchase and easement in place. The vision of KXLY is to add more commercial property from the corner of 46th heading south along Regal into their property. They provided a letter of intent to the Park Board to enter into discussions about this plan and it was adopted by a resolution passed by the Park Board at their meeting in January 2014. Now a swap would likely take the form of a sale or long-term lease, both of which the Park Board (and city law) saws require a vote of the people of Spokane. This concept would also require a land use amendment since the park land is zoned single-family residential and would have to be converted to some form of commercial zoning. So as you can see, this land sale and easement are the first two dominoes that set the stage for some rather drastic changes to the current makeup of our neighborhood, especially our largest park. I encourage you to read the proposed sale agreement and to attend the November Southgate Neighborhood Council Meeting so we can start this process off on the right foot and make sure the development plans are appropriate based on the guiding laws and policies of Spokane. Here is a good example of what we are trying to avoid in terms of street design in the Southgate District Center. The Atlantic shared this a month or so ago and it is applicable to our neighborhood planning situation all over Spokane. We want to avoid a stroad at all costs. Spokane is rife with stroads, and Regal Street could join the list if we don’t get the city to enact the District Center code requirements and neighborhood plans. A stroad is a poorly designed street that neither accommodates auto traffic well, but also does not encourage multi-modal transportation or maximize the land use around it. There is a persistent myth that adding more lanes eases congestion, when in reality all it does is bring more traffic. Multiple studies going back to the late-60’s have concluded that expanding traffic lanes will initiall ease congestion, but the expansion also lowers the “cost” (in terms of time/convenience usually, but also in economic terms) of a trip and induce more cars to use the road. This is called induced demand. According to later studies, within about 5 years 80% of the extra capacity is used up and congestion returns worse than before. This raises the pressure for more capacity and further expansion into less congested areas, a condition we all know and love as suburban sprawl. In the case of our District Center, the city has determined (on two occasions now) the level of new traffic created by development in our District Center does not warrant more lanes along Regal or Palouse (as measured by their traffic models and a result they call Level of Service). That is not to say it will be completely without effect and the city does collect traffic mitigation fees and apply them to traffic projects around the development. In Southgate they are adding the stoplight at Palouse and Regal to help make it easier for vehicles to turn left onto Regal and for pedestrians to make it across Regal. I think we can all agree getting onto southbound Regal from Palouse Hwy can be a hassle occasionally. The measures being supported by the Southgate Neighborhood Council are aimed at making the area more usable for all types of users: auto, transit, bike, and pedestrian (an approach known as Complete Streets). This aligns with both the Spokane Comprehensive Plan that says the priority consideration for transportation use in Spokane should be pedestrian, bike, and auto, in that order (TR 1.1, pg. 12); and the the Complete Streets Ordinance of the Spokane Municipal Code, which states that all streets shall include complete streets elements. Both of these documents, as well as current best practice in urban planning, point out the need to consider more than just auto user needs on our roads. And that is how you get back to avoiding the cycle of induced demand: options. When the “cost” of getting in your car to go to the new District Center is equal (or even higher than) to the “cost” of walking or biking on dedicated sidewalks or trails, then we will actually start seeing reduced demand. And that is the only lasting way to relieve congestion. The idea of creating options includes options for autos. If people feel Regal is too crowded and will only get worse, then there needs to be other route options available to them to get through or around the District Center. That’s why the Southgate Neighborhood Connectivity and Transportation Plan (with maps) makes one of it’s priorities “completing the grid”. Our neighborhood has very poor east/west connectivity. Between 37th and 57th there isn’t a single complete east/west route. Giving people better options for moving east and west across our neighborhood would relieve the pressure on Regal Street and maybe even get people home faster. Now, creating a complete street environment will take some traffic calming, which we will discuss in the next post. I think this is a long enough post for one night, stay tuned for Part 2: Traffic Calming. The City of Spokane is updating the transportation chapter of the city’s Comprehensive Plan in 2014. On Thursday they released a 12-page booklet with the Inlander that outlines the process, the philosophy that drives it and some draft goals for the final product. There are some great ideas in the document, some of which are already being enacted. Projects like the Crestline water main and the upcoming High Drive redevelopment incorporate some of the vision the city is talking about (combining transportation and utility projects to stretch limited funds). The big question is how these concepts, some of which are already in the current Comprehensive Plan, can be enacted in current projects like the development of the Southgate District Center. The booklet emphasizes the need to encourage multi-modal transportation options with the goal of creating “livable streets”. Features like dedicated bike lanes, roundabouts, and pedestrian connections are held up as “Best Practices” in transportation planning and design. These are all elements of the complete streets approach Southgate Neighborhood took in developing our Neighborhood Connectivity Plan. I encourage you to look at the city’s plan and see how it melds with our neighborhood’s. The city is encouraging public input through a series of open houses starting early next month. The full list is on the back of the brochure or can find the information on the Spokane Planning Department website. I’ve also entered the events on our website calendar. Now is the time to put this on our radar and give our input to the city since this update will set the tone for transportation planning in our area for the next 20 years.